208 people have been detained after French riot police clashed with environmental protesters in Paris. The demonstrators had gathered in the Place de la Republique, as the city prepares to host the UN Climate Change Summit (COP21), which begins on Monday. However, with security high following the Paris attacks, police asked protesters to leave the square and fired tear gas to disperse the crowd. It was one of thousands of environmental demonstrations taking place across the world ahead of tomorrow's UN Climate Change summit in Paris. AP reports that those arrested were in possession of projectiles or other weapons. In Ireland, thousands have turned out for demonstrations taking place in Dublin, Cork, Galway and Belfast. The biggest march is in the capital, and got underway at the Custom House at 2pm today. Demonstrations have already taken place in cities across Australia, Europe and Asia. In Paris, thousands of demonstrators formed a 3km-long human chain along the city's Boulevard Voltaire - the road where the Bataclan Theatre is located. 89 people were killed at the site in the recent terror attacks on the city. Due to the state of emergency in France, large-scale protests have been banned, leading to the cancellation of a huge demonstration that was planned in the city today. 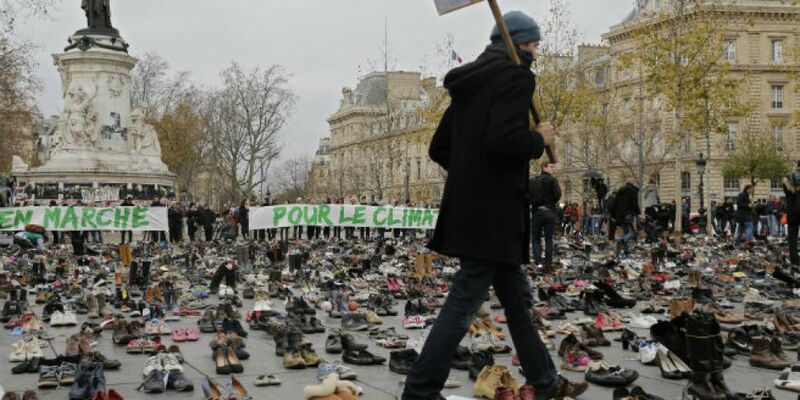 However climate change protesters left hundreds of shoes at the city's Place de la Republique as a symbolic gesture. Tens of thousands of international delegates are attending the two weeks of talks in the French capital, including government representatives, UN officials and NGOs. The Taoiseach, the Environment Minister and the Minister for Energy and Natural Resources will be representing Ireland. The UN says this is the first time in 20 years of negotiations that countries will "aim to achieve a legally binding and universal agreement on climate, with the aim of keeping global warming below 2°C". Achieving this goal would require reducing worldwide emissions by 40-70% by 2050, and by 100% by the end of this century. Climate Change Officer with Oxfam Ireland, David Healy, says his charity is urging people to join the marches today. "It's for people to come out and show our support for serious action at this stage. We're facing a crisis in climate terms," he explained. Leader of the Green Party Eamon Ryan says there are steps Ireland should take to improve the environment. "We've to stop burning peat in our power stations. We've got to stop burning coal. And we could say no to fracking for gas," he said.